Ladies and gentlemen, the blog is back. After a long hiatus, I will be resurrecting the blog this month. It's been too long, and I've missed the practice of writing. It is oh so good for my soul, and I was beginning to love this little space and the community of the blogging world. For now, here's what's been happening in my neck of the woods. hearting: Right now I am loving the simple things- my favorite pens, a good salad for lunch, and quality time with friends. 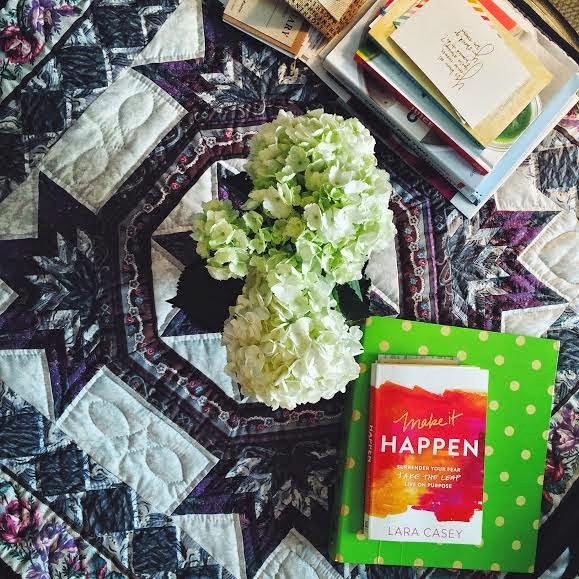 reading: I'm almost done reading Make It Happen by Lara Casey, and it has been such an incredible book. The way Lara so openly and honestly shares her story is such an encouragement to me. pinning: This year is the first time I've made a vision board, and I liked taking the time to consider images that I thought would represent what I hope this year holds for me. eating: I've been eating all the Halo and Cutie oranges I can get my hands on. It's been a slow battle against some nasty sinus junk around these parts, and I am trying to get all the vitamin C I can. anticipating: Not going to lie, I am looking forward to my next day off from school. The winter blues are a real thing, people. I'm greatly anticipating a day off on President's Day in a couple weeks. Can't get enough of Cuties around here too. And favorite pens! The simple things really can be great. Thanks for joining us this month! Thanks for reading and hosting a great link-up! Laura Casey's book is on my to do list! I love cuties too! Stopping by from Oak and Oats link up. Hi! I really want to read that book :) so glad you are loving it!! It is definitely one I'd recommend to anyone who wants to make things happen! Ahhh, I am about to read that book! My friend is having a copy sent my way, and I can hardly wait! !